The heads of the self-proclaimed Donetsk People’s Republic and Luhansk People’s Republic have appealed to Angela Merkel and Francois Hollande to put pressure on Kiev to stick to the obligations it committed itself to in the agreement signed in Minsk. 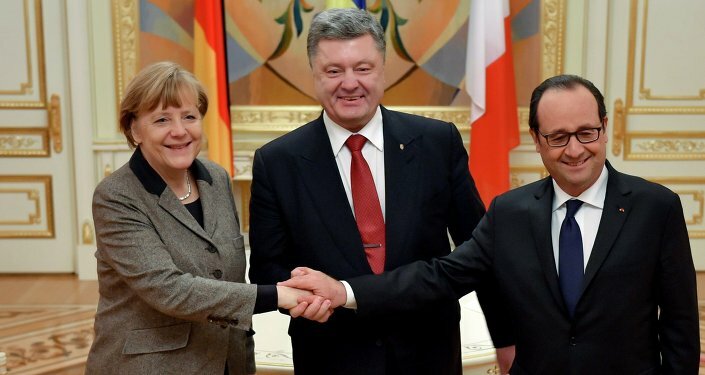 The heads of the self-proclaimed DPR and LPR have appealed to Angela Merkel and Francois Hollande, saying that Kiev is sabotaging its obligations under the agreement signed in Minsk in February this year. 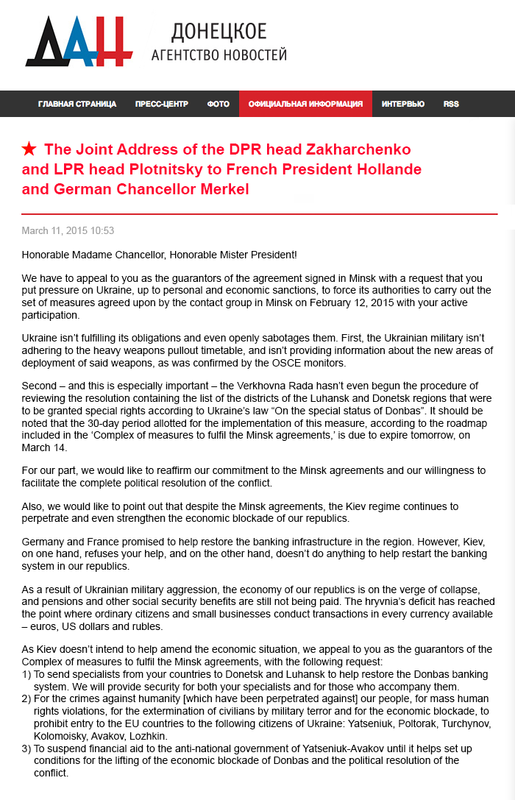 “We have to appeal to you as the guarantors of the agreement signed in Minsk with a request to put pressure on Ukraine, up to personal and economic sanctions, to force its authorities to carry out the set of measures agreed upon by the contact group in Minsk on February 12, 2015 with your active participation,” the Donetsk news agency quotes the two heads of self-proclaimed republics as saying in a joint statement. The self-proclaimed Donetsk People’s Republic's negotiator Denis Pushilin has warned that Kiev has only one more day left to grant the Donbas territories a special status. “The Verkhovnaya Rada [Ukrainian Parliament] has to define the list of territories in Donetsk and Luhansk regions that have a special status. Kiev has only 24 hours left to fulfil its obligations. In the event that such a decision is not reached in 24 hours, it will be evident to the whole world that Kiev has no intention to stick to the roadmap signed in Minsk,” Pushilin said in a live broadcast on the news channel “Russia 24”. Earlier in March, Germany has already expressed its dissatisfaction with the slow pace of fulfilling the Minsk agreement. On February, 15, in accordance with the new Minsk agreements, Kiev forces and independence supporters of Donbas have ceased hostilities. The truce between Kiev forces and independence supporters in Donbas is one of the agreements reached by the leaders of Ukraine, France and Germany and Russia on February 12 after 16-hour talks aimed at the de-escalation of the conflict in eastern Ukraine. Other Minsk agreements stipulate the creation of a buffer zone between the warring sides through the withdrawal of heavy weaponry from the region and Kiev's decentralization of power, which may lead to more liberal arrangements for the eastern Ukrainian regions of Donetsk and Luhansk as well as an all-for-all prisoner exchange.